• Boost citizen and staff confidence in the agency. 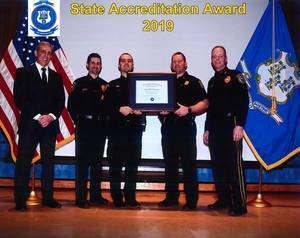 The Wilton Police Department becomes the 37th police agency in the State of Connecticut to hold an active Accreditation status. The Department would like to thank its entire staff for their contributions in the achievement of Connecticut POST-C Tier-1 Accreditation status. Specifically, the Department would like to recognize Sergeant Steven Rangel who spearheaded the accreditation process as the Department’s Accreditation Manager. Sergeant Rangel worked tirelessly and exhibited great professionalism in guiding the Department to the achievement.